Chelsy Atkins is a Yamaji Widi woman from the Mid-Coast of Western Australia. From a family of seven Chelsy grew up in the bush near Tamworth. Her father and first inspiration is acclaimed didgeridoo virtuoso, Mark Atkins – story-teller, song writer, composer and painter. Being exposed to this artistic brilliance and culture has influenced Chelsy’s unique sound of Indigenous folk – rockin’ – pop. 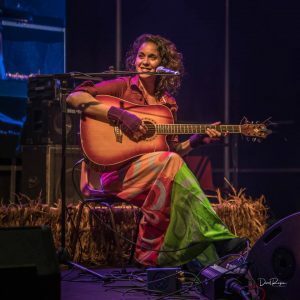 Her captivating, melodic songs weave tales of life and truth, enhanced by her hypnotic guitar playing and a powerful voice that bends and flicks like the sounds of a didgeridoo.